Fischer C-Box Cup Holder $17.99 - Ultimate Cupholders - Cup holders for 5 Series and 7 Series BMW, Z4, Porsche Boxster / Porsche 911 996, Mercedes, Audi, Acura NSX and other fine cars. The ultimate cup holder / cupholder! If you have a vehicle (or a second vehicle) that's not addressed by the Ultimate Cupholders, you may want to take a look at these. They're about the best universal cupholders that I've found. They're made in Germany by Fischer Automotive Systems, a major supplier to vehicle manufacturers around the world. 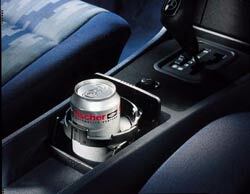 Fischer makes many of the small boxes, CD and cassette holders, cup holders, and other storage compartments found in German and other higher-end cars (e.g., the storage compartment with the "roll-top" lid in the center console of the BMW E39 5 Series, in-dash CD holders in the Porsche and Mercedes, all are Fischer products). The cupholder shown here is used as line-fitment, for example, in the Mercedes E Class. Automatically adjusts to securely hold almost all shapes and sizes of beverage containers, with a diameter of up to 3 3/4" (94 mm). Space-saving unit is completely hidden in outer case when closed. Allows for fitment on vertical or horizontal surfaces, and is suitable for placement against center consoles, side-walls, in compartments between the seats, on the dash, or almost any other location. Attaches with Velco, adhesive tape, your own custom brackets, or screws (included, but you'll need to make the holes), or, providing that the location is suitable, also can be integrated into storage or other compartments in specific vehicles. Bottom of case provides support for drink containers and acts as a drip-tray. Durable black matte finish blends well with most automotive interiors. Dimensions (closed) are approximately 4 3/4" wide by 4" deep by 1 1/2" high. NOT a cheap, generic $2.99 accessory marked up to $20 as are many of the others that you'll see (such as the common folding holders with the flip-up arms). They're made of a heavy ABS plastic. I've personally torn these apart for specialty use and they're tough. Also works well for boats and other uses. Non-corrosive in marine environments. Typically, they're sold through automotive specialty catalogs (e.g., Griot's Garage, Shaper Image, etc.) at as much as $45. I've made arrangements to offer these at the lowest possible cost that you'll find anywhere by buying them bulk packaged in plastic sleeves. This omits only the retail box and a very limited (one paragraph) instruction pamphlet. Not worth the added cost in my opinion. If you'd like, you can view/download the instructions. I also have simple rear console mounting brackets for the Fischer holders that provide for easy installation at the rear of the center console in the BMW E39 and other cars with a similar design. from SK Facom, Ingersoll-Rand, and others at great prices? Copyright © 2018 by Netropy LLC. All Rights Reserved. U.S. and International Patents and Patents Pending. "UltimateCupholders.com," "Ultimate Cupholders," "Ultimate Cupholder," "Ultimate Cup Holders," Ultimate Cup Holder,"
and the Ultimate Cupholders logo are trademarks or registered trademarks of Netropy LLC.